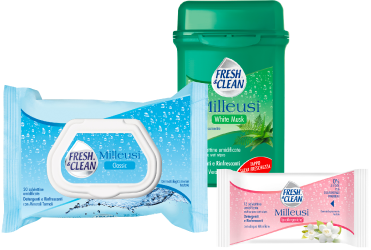 Fresh & Clean offers you a varied range of products and solutions for different personal hygiene needs. Find out which ones with F&C App! Sweet formulations for babies to protect and cuddle. FORMULATIONS do not contain COLORANTS, PARABENS, ALCOHOL. NICKEL TESTED, SCENTED WITHOUT ALLERGENS, HYPOALLERGENIC. Nickel lower 0.00001%. Products formulated and tested to reduce the risk of allergies.